I have written previously regarding the importance of preserving what most would deem as trivial communications; letters. I shared with you a video from Roots Television regarding the impact that a single letter can have on a single person's life. Andrew Carroll who began the project after a catastrophic experience in his family's life where he lost all of the letters that his family had collected over several years due to a fire. He mentions in the video how he mourned the loss of those letters explaining how the letters provided very intimate details of their family's life. Today, I am reviewing the website titled "The Legacy Project" specifically the link regarding preservation of letters. Instructions and suggestions for preservation of old letters, cards and emails are listed under this tab. The site also discusses how to store and display these treasures. Information regarding archival companies is also available. You might be asking yourself, why should I keep any old letters? What value can they have? I can tell you from personal experience that some of the letters that I have saved from my spouse who passed away a couple of years ago, my aunts and uncles have become priceless treasures for me. Think about the first time you received a note from a friend passed in a school class. Whether the note was good or bad, it brings back memories. This is the value of saving letters. Preserving Memories. If you would like to learn more about how to preserve letters, please click How to Preserve Letters. While you are at this site, read through some of the information provided about the project. It is a honorable and worthwhile project that is being taken care of through the volunteers of the project. Have fun and keep writing! 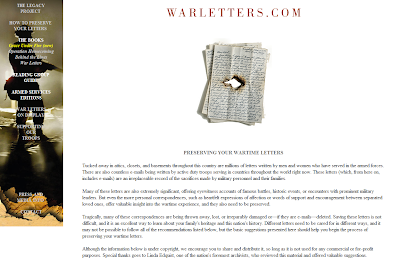 This Project is still collecting letters of war veterans and their families. I came across a couple recently who had kept all his letters from WWII. They had been going together for 5 days when he left for the Normandy beaches. His letters, written from the most difficult circumstances, made her love him. Still together after 60 years, she looked at them again for the first time for a video biography we were making. Priceless. Jane, thank you for sharing your experience regarding the couple that corresponded during WWII. Letters are a very intimate way to learn more about an individual. I know that as I have read letters from when my husband and I were dating, I am transported back in time and the feelings that I had as I read the letters the second time were exactly the same as the first time. Letters are wonderful. The electronic age is wonderful, but there is something about having a letter written by hand on paper that is very special.